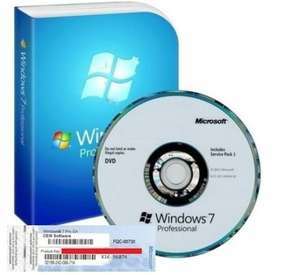 This installation package will work on any PC or Laptop capable of running Windows 7 Professional. (Minimum specs are stated further down). License will allow activation of a single machine, this is also the 64Bit edition. Allows you to do a clean install of Windows 7. This auction includes the DVD and COA license in accordance with both eBay and Microsoft policies, as such you are also purchasing a decommissioned, and beyond economical repair Dell Optiplex PC Hardware. In compliance with Microsoft licensing, recovery media, OEM media and MAR media containing Microsoft software must be redistributed as part of a complete package that contains the media, the original computer hardware with which the software was distributed and the corresponding COA label. In compliance with the above policy, this is a sale of complete package which includes the original Dell media DVD and original hardware (Dell Optiplex computer system containing original motherboard). OEM/Reinstall Disks/MAR Software - Recovery media, OEM media and MAR media containing Microsoft software must be redistributed as part of a complete package that contains the media, the original computer hardware with which the software was distributed and the corresponding COA label. In compliance with the above policy, this is a sale of software bundled together with the original computer system. This item is also not intended for use by general consumers. eBay Policy States: "OEM, bundled, or recovery software may be listed only if it is included along with the original hardware, such as the motherboard, hard drive, or computer sold with the OEM software." In compliance with the above policy, this is a sale of software bundled together with the original hardware (barebones computer system containing original motherboard which is broken beyond economical repair). Microsoft Policy States: "Large brand-name computer manufacturers, such as Dell and Compaq, often include OEM software on non-holographic “recovery” or “reinstallation” discs that show the manufacturer’s brand name. These software packages are typically marked with a phrase that states, for instance, “For Distribution with a new Dell PC only.” Recovery or reinstallation software is licensed only for distribution with new computers and can be redistributed only with the computer for which it was initially distributed. Distributing such software with individual PC hardware components (e.g. hard drive; RAM) does not comply with Microsoft’s OEM distribution requirements." In compliance with the above policy, this is a sale of software bundled together with the original computer system. The cd doesn't look like any Windows 7 genuine cd I've ever seen! About £15 over the going rate for pukka OEM codes on Ebay. That's probably what makes this a worthwhile purchase, assuming it is genuine and not some dodgy old stickers pulled off corporate computers. Actually not true, you have to validate the Key with MS, they won't let you download the image if its OEM, they tell you to go to the supplier\PC manufacturer. All these cheap ones are normally OEM (Dell\HP) So actually worth getting a proper CD if you don't have one rather than a copy which you have no idea if its got any dodgy stuff. I did a couple of fresh installs and all were working fine. Two I upgraded to windows 10 (for free at the time) and the other 2 are working fine, still no issues with the key or anything. Actually not true, you have to validate the Key with MS, they won't let … Actually not true, you have to validate the Key with MS, they won't let you download the image if its OEM, they tell you to go to the supplier\PC manufacturer. All these cheap ones are normally OEM (Dell\HP) So actually worth getting a proper CD if you don't have one rather than a copy which you have no idea if its got any dodgy stuff. That's probably what makes this a worthwhile purchase, assuming it is … That's probably what makes this a worthwhile purchase, assuming it is genuine and not some dodgy old stickers pulled off corporate computers. Like simon said. Don't trust any DVD that you get with these purchases unless you are 100% sure it's an original. This is the most important software that you can install that needs to be virus free. It's always best to download the most up to date iso directly from m$ and burn the DVD yourself, unless you are one of those people with tons of browser toolbars. However, you can't download a win7 iso directly from them with a win7 oem key. Like simon said. Don't trust any DVD that you get with these purchases … Like simon said. Don't trust any DVD that you get with these purchases unless you are 100% sure it's an original. This is the most important software that you can install that needs to be virus free. It's always best to download the most up to date iso directly from m$ and burn the DVD yourself, unless you are one of those people with tons of browser toolbars. However, you can't download a win7 iso directly from them with a win7 oem key. Yep all true. However it is still extremely easy to download ISOs for any version of Windows directly from MS without any key. Takes 10 seconds to google very easy instructions. You can still upgrade to windows 10 for free with a valid windows 7 install (even an OEM license), via the "Windows 10 upgrade for assistive technology users" page. Just fyi.